This is my last Monday of the school year though! This was the longest school year ever and I cannot wait for a summer full of ice cream, pools, and margaritas. We haven’t had much going on recently because of all the rain. Omg, the rain! Make it stop. We need no more rain. Thankfully we haven’t had to deal with all the flooding that most of Texas is dealing with but man, it’s been a rough couple weeks. So anyway, yesterday the sun finally came out and the kids got to spend the day outside with their friends. And the husband finally got to grill without getting soaked by rain. 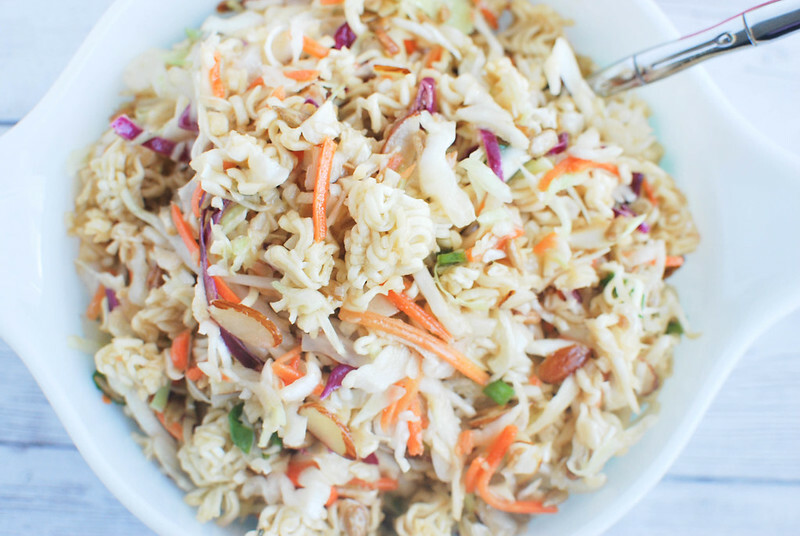 I’ve been craving this Ramen Noodle Salad recently and knew it’d be perfect with some barbecue chicken. It’s basically cole slaw but with lots of crunchy stuff mixed in. Sunflower seeds, sliced almonds, and yeah, crushed ramen noodles. It’s the perfect summer side dish for when you’re over pasta salad and you always over boil your potatoes for potato salad. Just me? 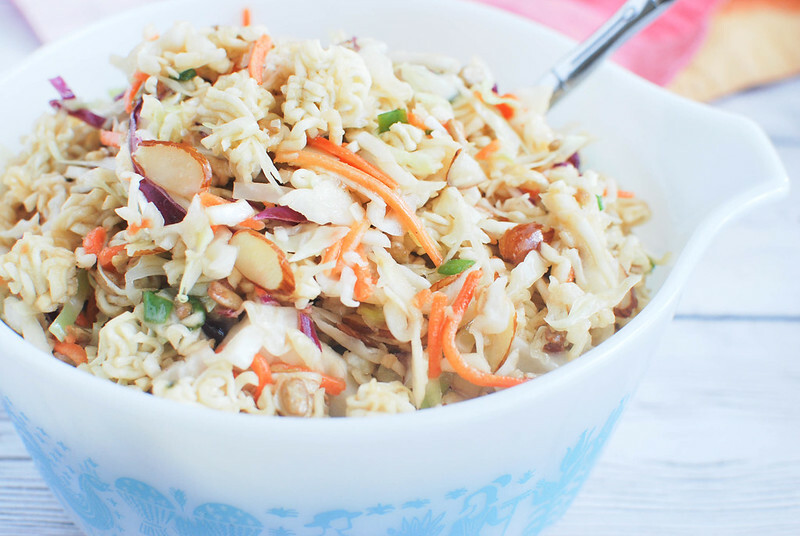 In a large bowl, combine cole slaw mix, green onions, sunflower seeds, and almonds. Crush ramen noodles and add to the bowl. Toss to combine everything. In a small bowl, whisk together the ramen seasoning packets, vegetable oil, apple cider vinegar, and sugar. Pour over the cole slaw and toss to make sure everything is coated. 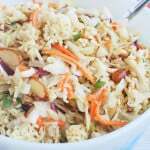 16 Responses to "Ramen Noodle Salad"
My mother used to make a ramen noodle salad – it was delicious! Your version looks amazing! Looks like a perfect summer picnic salad. This recipe is actually making my mouth water. It looks amazing!!!! Totally making this. I really want to make something like this!! Looks totally amazing! The perfect side dish for a backyard bbQ! Yay for it being the last week of school!!! And I second NO MORE RAIN!!! haha we’ve had straight rain for 3, maybe 4 weeks?! It’s crazy! 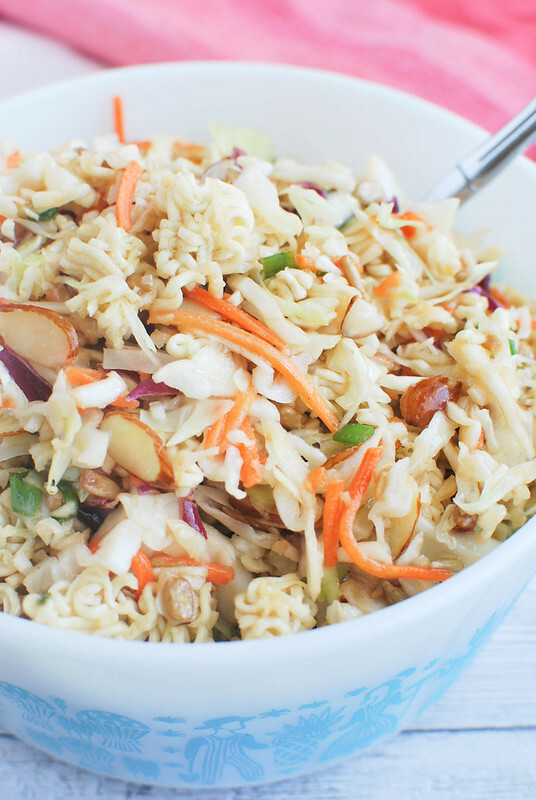 This salad looks so delicious – I have had ramen noodle salad a few times and always loved it. This one looks perfect – love the sliced almonds on it too! I agree, this is the perfect summer salad. Although I haven’t had this exact recipe, I’ve had similar and you can’t be the texture combo and flavor. I was wondering if you’re in the part of Texas that’s flooding, thanks you’re not, looks bad. I just want to point out that your vintage Pyrex bowl is awesome! I make a mean Ramen Broccoli Salad. Love that ramen crunch. Will try your recipe to change things up! Yep, this salad is a classic! I actually made it last night, but instead of making the dressing cuz I am lazy as heck, I used my favorite light sesame ginger dressing. SOOOO GOOD!!! LOVE the creamy and the crunchy! And totally jealous that you get out of school so early down there — we have the full month of June to go! This is perfect for summer. Quick, easy and delicious! I haven’t had this recipe in such a long time, but it was one of my favorite salads to make to take to a party. Can’t wait to get it back in rotation for all the upcoming BBQ’s. My friends in Dallas were drinking every night and on the verge of pulling all of their hair out because of the rain. . but yeah, I heard the flooding was really bad in the Houston area I think?? Anyway. . ok this ramen noodle salad . . can I tell you how awesome it is that you used ramen noodles?!!! 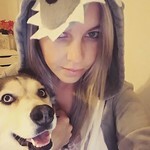 I love this!!! Oooo! Crunch, crunch, crunch! Love that you incorporated the flavor packet from the noodles. Love this salad as an option to all the rest! omg I totally want a big scoop of this on my plate. Never had a salad like this. yum!